What's better, Latex or Memory Foam Mattresses? What's most important to you? Health? Comfort? Durability? We decided to compare latex and memory foam mattresses and let you decide for yourself. After all, who better to help you figure this one out? We do make some of the best latex mattresses in the world. A) Memory foam mattresses are known for their pressure relief and comfort...but are made with some pretty harsh chemicals. B) Latex mattresses are known for being durable, natural and healthy but aren't known for comfort. Natural, latex based memory foam is NEW and has been featured on Dr.OZ, Tiny House Nation, O Network, Rachael Ray and much more. Because people demanded a more comfortable latex mattress, Essentia spent 3 years developing a unique and patented latex mattress. You can learn more about how our mattresses are made. Latex mattresses used to be sold at Sears! They've been around since the 50's and are some of the healthiest and most eco-friendly mattresses available. However, their comfort leaves much to be desired since the more natural they are the firmer they tend to be. Memory foam mattresses outperform latex mattresses in all tests which measure comfort, like proper blood circulation. Pressure point relief is a clear sign of comfort. A memory foam mattress offers your body the best sleep surface on the market, with better blood circulation and contouring support being big pluses. BUT, most memory foam is made using harsh chemicals. Petroleum based memory foams are made using known carcinogens and have been linked to itchy eyes, respiratory issues, headaches etc. Making the healthy choice (natural latex) or comfortable choice (memory foam) is a dilemma for consumers. Keep in mind you could always get the benefits of both with our natural memory foam mattresses. What is Latex Foam and Why isn't it Widely Used? Latex foam is a type of foam designed to outlast traditional spring mattresses. It can be made using natural or synthetic (manmade) ingredients. Natural latex foam is processed Hevea milk (rubber tree sap). It's rare to find natural latex in brand name mattresses since it's expensive and durable, lasting 15+ years. Big box companies will usually only include 1 - 2 inches of natural latex on top so they can promote the mattress as “natural”. In reality, the bed is made up of more synthetic materials than anything else. Be suspicious when companies don't mention the percentage of natural content in their latex. Keep in mind that it's just not feasible for any mattress under $1500 to be made entirely of natural latex due to the costs. Sap from the Rubber Tree (Hevea brasiliensis) is collected and processed into latex; the finished product is used in mattresses and pillows. 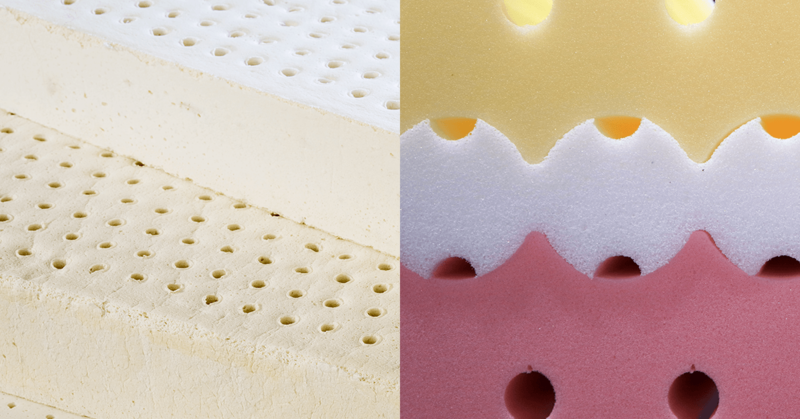 The Talalay process of making latex results in a softer-feeling foam. Synthetics and air are always added to achieve this. 100% Natural Talalay does not exist and most Talalay on today’s market is heavily blended, if not 100% synthetic. The Dunlop process of making latex creates a firmer feeling foam. Both Dunlop and Talalay latex can be made 100% synthetic. People often say that Talalay is the superior latex. This is false and here's why. Dunlop latex foam was put to market in the 1950's. The goal was not to create natural foam, it was to create a longer-lasting, consistent feeling product than other foams on the market. Talalay latex foam was then invented. It felt better than Dunlop foam since it was softer, more durable and had a more consistent feel. To do this, 50%+ of the natural ingredients were replaced with synthetic latex. Remember "natural" was of no concern back then, it was all about the properties of the foam. As technology improved, Dunlop latex evolved and caught up in terms of performance, durability, and consistency. Today, Talalay is still the softer latex foam but it remains highly synthetic. That's why you can't and will never find GOLS certified Talalay latex because it exceeds the synthetic ingredients tolerated by the GOLS or Global Organic Latex Standard certification. How do Latex Mattresses Compare to Spring Mattresses? A latex mattress roughly provides comfort equivalent to that of a spring mattress, but with extended durability (10-30 years). The main difference between the 2 types of mattresses is component quality. Companies manufacturing natural latex mattresses tend to opt for environmentally friendly materials; natural and organic wool and cotton. Traditional spring mattress manufacturers tend to use synthetic foams and chemically treated synthetic fabrics etc.